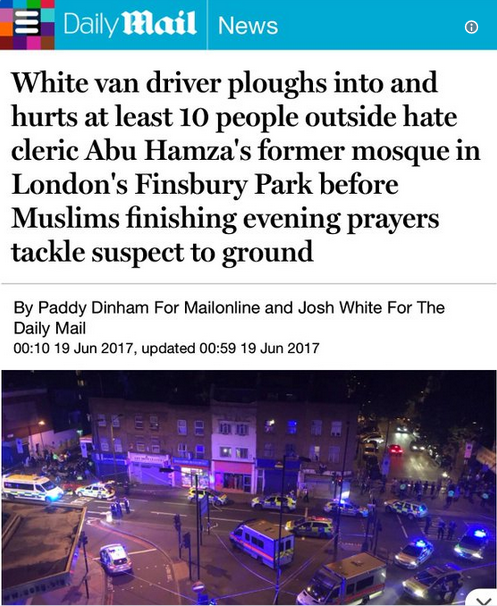 The Daily Mail‘s original headline on the attack on the Finsbury Park Mosque described it as “hate cleric Abu Hamza’s former mosque”–despite its having an entirely different leadership in place for the past 12 years. CNN, the New York Times, Daily Mail and News.com.au all decided to use last night’s horrific attack on London’s Finsbury Park Mosque welfare center as a chance to litigate the mosque’s past behavior. A 48-year-old white man rammed his van into a crowd of people outside an Islamic welfare center associated with the Finsbury Park Mosque, killing one and injuring up to ten. Immediately, the “context” trolls at major corporate media decided to jump in and began digging up dirt on the victims’ place of worship. Modern thought control is dependent on subliminal communication. Messages influencing key perceptions are delivered unseen, unnoticed, with minimal public awareness of what is happening or why. Note: The Global Research website at globalresearch.ca as well as our French language site mondialisation.ca have experienced technical difficulties in the course of the last few days. Video: Greenwald: Is U.S. Exaggerating Threat to Embassies to Silence Critics of NSA Domestic Surveillance? 5 August 2013 — Democracy Now! A few days later they pulled the article. Around 1,200 riot police were mobilised in London Tuesday against anti-capitalist protesters. Throughout the day the police attacked supporters of the StopG8 group, making a total of 57 arrests. The killing of soldier Lee Rigby in Woolwich, London has lifted a corner of the carefully constructed veil of lies, intrigue and criminality surrounding British foreign policy. The Mail on Sunday today reveals shocking new evidence of the full horrific impact of US drone attacks in Pakistan.